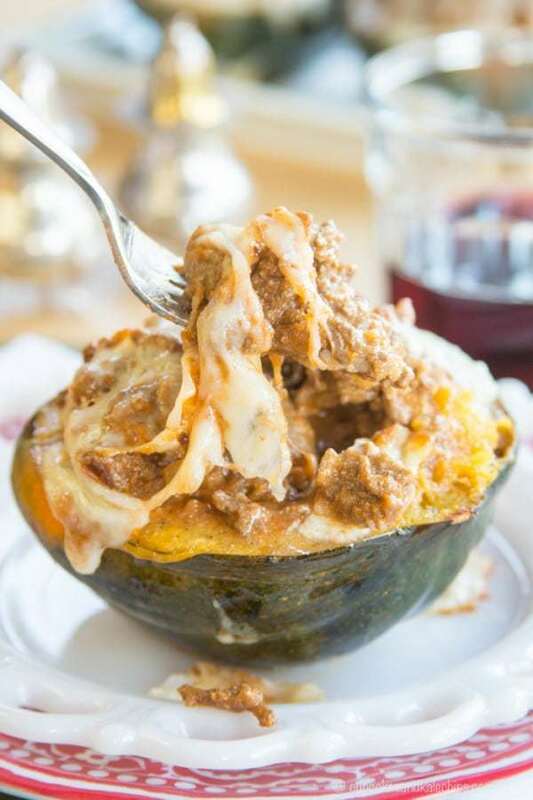 Roasted acorn squash filled with hearty ground beef and tomato sauce, plus three kinds of cheese is a veggie-packed dinner recipe inspired by your favorite Italian comfort food. Cheesy and delicious. Lower carb and gluten free. 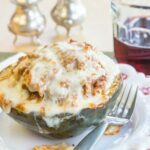 Stuffed acorn squash is filled with ground beef, a simple and savory sauce, and three kinds of cheese you find in a classic lasagna such as the World’s Best Lasagna. 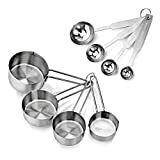 It is sure to remind you of your favorite Italian comfort food recipe. But by swapping the pasta for squash in this acorn squash recipe, you’ll cut the carbs and turn it into a veggie-packed dinner. It is also quicker and easier than the original, plus it’s gluten-free. 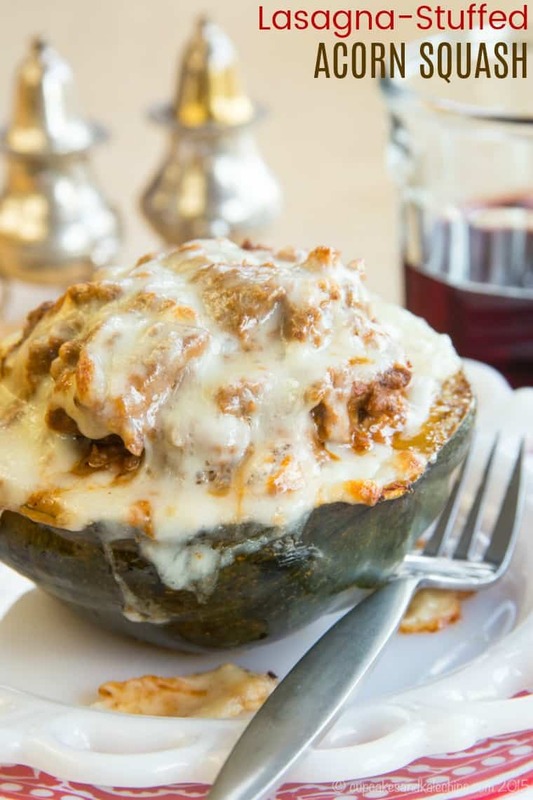 With all the meaty, cheesy goodness you love in a healthy dinner recipe that’s ready in about 30 minutes, get ready to make this Lasagna Stuffed Acorn Squash. Have you guys discovered the service at your grocery store where they will shop for you? Oh my goodness, a game changer. I was totally against this for the longest time. I wanted to look at my meat, feel my fruits and veggies, the whole nine yards. Maybe it’s the food blogger thing, wanting food that is photogenic when I’m making and photographing, say, Maple Roasted Brussels Sprouts and Butternut Squash or Cereal and Yogurt Stuffed Apples. Plus when I first tried it, I think it took me three times as long to place my order (their app was kind of glitchy), never mind having to go and pick it up and haul it out to my car. But at the grocery store near my house now, get this, you place the order, drive up, hit a button outside, and they come and load it in your car. Swipe the credit card and you are done! Plus, despite the fee, I think it really does save me money. First of all, since I do still like to see my meat, I tend to buy that in bulk either at my warehouse club or when it goes on sale at the store, and I make a trip myself. When you buy meat in bulk, it’s usually at a lower price. It’s easier to stick to my list since I am not in the store giving in to impulse buys. And I don’t use the service all the time. Most of the time I still go to the store, and then I just wait for an email to come along that waives the fee if you place a $50 or $100 grocery order. If I have a particularly crazy week, it does save me some time to be able to “do my grocery shopping” while I’m sipping on my Blended Iced Coffee in the morning or watching Netflix late at night from my couch and just pick it up when I am out and about doing drop offs, pickups, or errands the next day. And the sanity I save by not having to drag two kids through the grocery store… priceless! 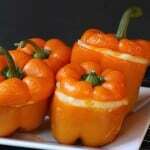 Is acorn squash gluten free? 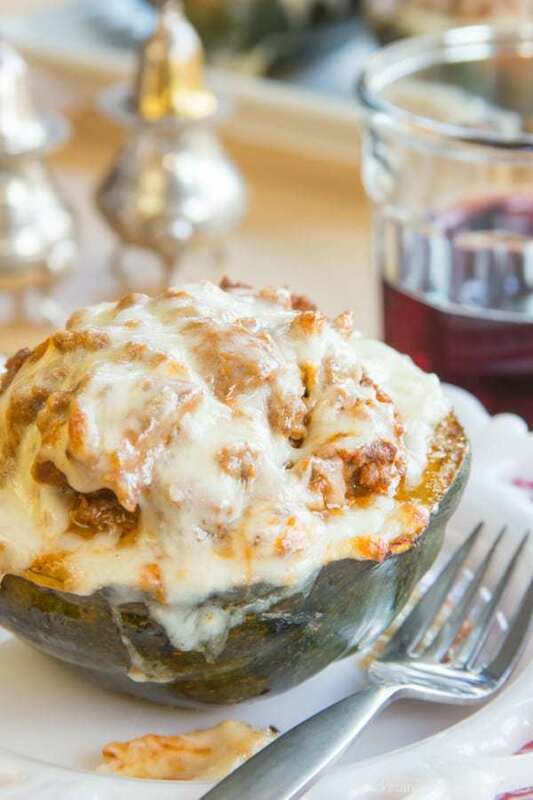 Acorn squash IS gluten-free, as is this stuffed acorn squash recipe. How do you cut acorn squash? Be very careful when cutting acorn squash. 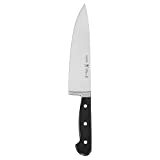 Make sure to cut it on a stable surface, such as a large wooden cutting board with a damp kitchen towel underneath. 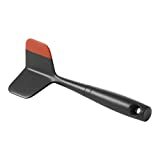 This helps to prevent the cutting board from moving around. Using a very sharp knife, cut the squash in half from top to bottom and scoop out the seeds. Then roast the squash cut side down for about 20 minutes. 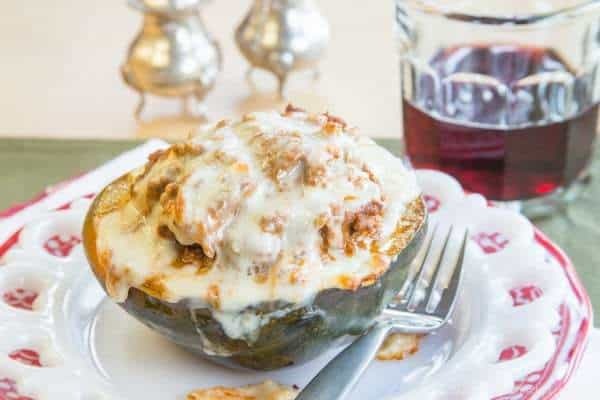 Acorn squash recipes can be very budget-friendly in the fall and winter when it is in season. Ground beef recipes are also frugal options. 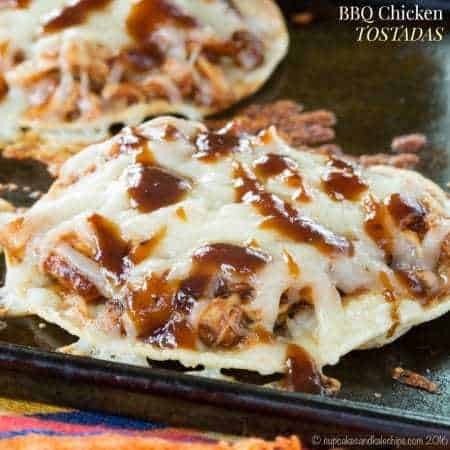 Combine the two into this economical dish that also just uses tomato sauce and cheese. While the acorn squash roasts, you’ll make the meat sauce by browning and seasoning ground beef, and add the tomato sauce. Remove the squash from the oven, flip each side over, and fill the squash halves with ricotta cheese and the meat sauce mixture. Top with mozzarella and parmesan cheese and pop back the stuffed squash in the oven just until the cheese melts and browns slightly. 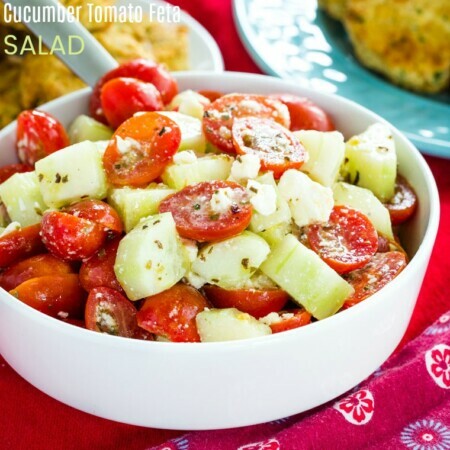 To keep the meal low carb and gluten free, serve it with a simple salad drizzled with Greek Yogurt Creamy Balsamic Vinaigrette Salad Dressing, Spinach Artichoke Cheesy Cauliflower Bread Sticks, or roasted broccoli. 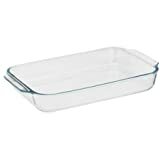 If the carbs aren’t a concern, serve some pasta as a side dish or even some crusty bread to dunk into that gooey middle. 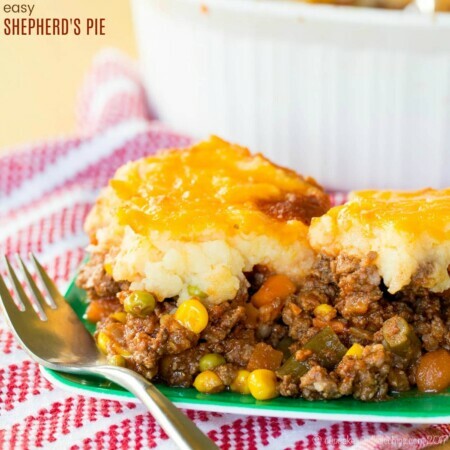 You could also try stuffing your cheesy goodness inside a Lasagna Stuffed Meatloaf! 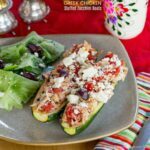 What do you need to make stuffed acorn squash? In the fall, everyone is looking easy dinners for busy nights, and it’s also the time of year for acorn squash recipes. 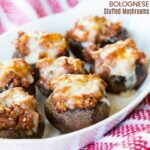 For many people, the pasta is the comfort food element of a classic lasagna, but if you are all about the meat and cheese, this is the meal for you. This recipe has that all stuffed into a bowl you can eat. And that bowl is a vegetable. That means your protein and your veggies all in one dish, plus it’s an inexpensive meal to make and doesn’t take a ton of time or effort. Preheat oven to 400°F. Coat a baking sheet with olive oil; set aside. Brush each squash cut half with ¼ teaspoon olive oil, then sprinkle with salt and pepper. Roast the squash cut side down until tender, about 20-25 minutes. While the squash is baking, heat a teaspoon of olive oil in a skillet over medium heat. Add the onion and ground beef, season with salt and pepper, brown the ground beef, breaking up as it cooks. Darin any excess grease, then stir in the tomato sauce and cook until heated through. Remove the squash from the oven and flip them over. Place a quarter cup of ricotta cheese in the bottom of each of the squash. Divide the meat mixture between the squash and top each with a quarter cup of mozzarella and about a teaspoon of parmesan cheese. Return squash to the oven and baked for about another ten minutes until the squash is tender and the cheese is melted and slightly browned. Yum! This squash looks so awesome!! My grocery store does the curb-side pick up as well, but if you order $100 its free. I LOVE it! With two small kids, its an amazing service! Wow, I wish mine were free. It is sometimes, but I can easily spend $100 on every order! Oh my goodness that certainly looks delicious. I’ve made this with spaghetti squash but never acorn. It sounds delicious! My silly boys won’t eat spaghetti squash!! What a terrific idea! 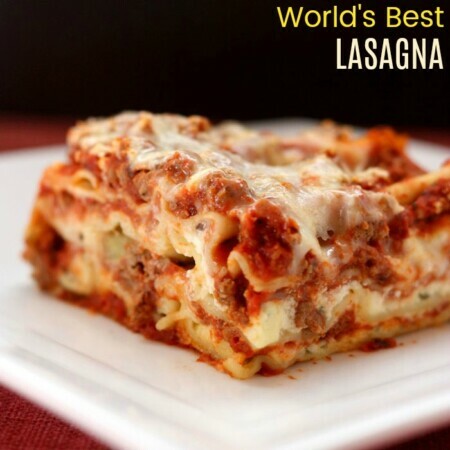 Sure a lot healthier than regular lasagna, but still cheesy and delicious! I’m all over this recipe! Like this week! Love how their are actually no noodles in it because I’m all about the meat and cheeses too! That lasagna looks so delicious! 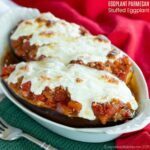 I only have acorn squash right now so this would be a perfect meal for us! Grumpy’s all about the pasta noodles but he’s loving on squash also so I’m sure he’ be all over this!